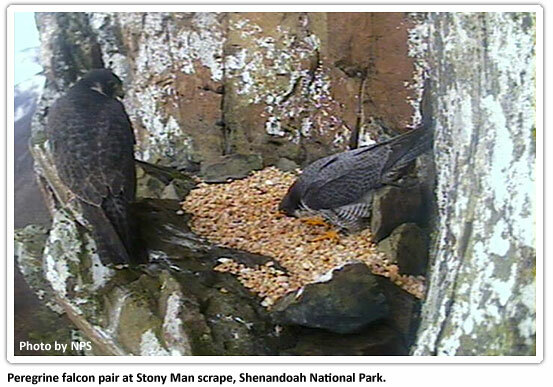 Nesting of peregrines in Virginia typically begins in March following a period of courtship. Peregrines have historically nested on the ledges of natural cliff faces in western Virginia. Although this mountain population is beginning to stage a comeback, the majority of peregrines currently nest in the Coastal Plain on artificial structures such as specially-constructed towers, nest boxes, bridges and tall buildings. The nest consists of a depression scraped in substrate such as dirt, sand, fine gravel, or debris. The falcons show considerable attachment to one nest location, and may return to it in successive years. The female lays 3-5 eggs at 48-72 hr intervals, and both the male and the female incubate them. Peregrines will raise only one brood per season, but may renest within a season if the eggs are lost during incubation. Incubation lasts 33-35 days. Chicks generally hatch within 24-48 hrs of one another. Young hatch covered in down and with their eyes closed. Within 5 days of hatching their mass has doubled, and they are almost fully feathered within 40 days. During this time they are cared for by the parents, who will brood them for up to 20 days and feed them. Chicks begin to fly when 40-45 days old. Although their first flight from the nest may be weak, the young are able to pursue adults to solicit food within 10 days. Peregrine falcons feed chiefly on avian prey, including shorebirds, pigeons, blackbirds, jays and other medium-sized birds. Their prey may range in size from small songbirds to large ducks. They kill prey primarily by striking them with partially-closed talons from above and catching them in mid-air as they fall. These high-speed strikes take the form of free-fall dives called “stoops”. Young peregrines acquire adult plumage in their third year. Age of first breeding is variable, ranging from 1-8 years, but typically occurs at 2-3 years. Females tend to breed one year earlier than males. Peregrines may live 16-20 years in the wild.